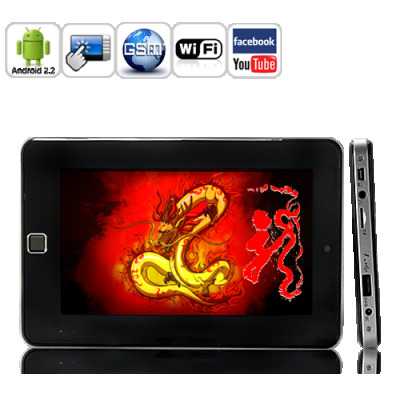 Successfully Added Android Tablet "Nine Dragon" - Phone, 7 Inch, Camera to your Shopping Cart. Enter the Nine Dragon Tabulus. This Chinese New Year, Chinavasion brings you the next generation of tablets - a mix of Phone and Tablet. With Android 2.2, WiFi, a 7 inch touch screen, front facing camera, 4GB internal memory, AND the ability to make phone calls, the Nine Dragon Tabulus has it all. The Nine Dragon Tabulus brings a lot of convenience and originality by merging a phone with a tablet. Now, no need for both a smartphone and a tablet any more, because you can do everything directly: make and receive calls, write and read SMS messages, browse the internet using WiFi, watch online videos, read ebooks, send emails, play your favorite games, and much more. Powered by the ingenious Android 2.2 operating system, the Nine Dragon Tabulus provides true multi-tasking, widgets, and many more features that can't be found anywhere else. It also comes packed with convenient applications such as email, YouTube, Skype, and gives one-touch access to the official Google Marketplace, which is home a huge selection of third-party applications for any purpose - work, personal, or entertainment. Best of all, with the performing Android 2.2, everything works smoothly and feels fluid. With a powerful 800MHz processor and 256MB of RAM, the Nine Dragon Tabulus Android Tablet will easily keep up with your every action and command. Programs load as fast as lightning, games play with fluidity, and you can feel you have a top-of-the-line gadget in your hands. For sure, this affordable Android Tablet is the best bang for your buck today and brought to you at a factory-direct price that can't be matched. The Nine Dragon Tabulus Android Tablet Phone brings you the power, fortune, and potential needed to maximize sales in your online store or dropship service. Order now and cash in before tablet phones become the norm. Available in our warehouse now, the Nine Dragon Tabulus is ready for immediate shipment to you or your customer. Brought to you by Chinavasion, the leader in wholesale consumer electronics. 3G Dongle: Supports Huawei E220, E230, E169G, E160X, E1750, E173; Bora 9380; Awit U8; Rate EC186; Aircard TD368. 2G SIM card is for calls only, not internet. Also, please turn off the tablet before inserting a SIM card otherwise the device might not recognize it. on 2012-05-29 19:13:10 What a fantastic piece of kit!! I purchased this with no real great expectations but how wrong was i? I haven't put it down since i got it much to the neglect of my children. WiFi works great, works brilliantly with emails and even better for documents which i have found to be a life saver when travelling about for work. Great fun with youtube, ebay and social sites if that's your thing. The amount of practicable apps and programmes is too much too mention. Well worth the money and i have been asked by so many people at work to get them one too. I can assure you they won't be paying the ridiculous low price i paid as i can see commission coming my way. Thanks Chinavasion. on 2012-03-24 22:17:31 It΄s very good.!!! !